The season of giving is here and what better way to treat your family and friends than with delicious baked treats? This recipe for Triple Ginger and Stout Cake generously drizzled with a stout butterscotch sauce screams Christmas cheer and is the perfect Christmas dinner treat these holidays. 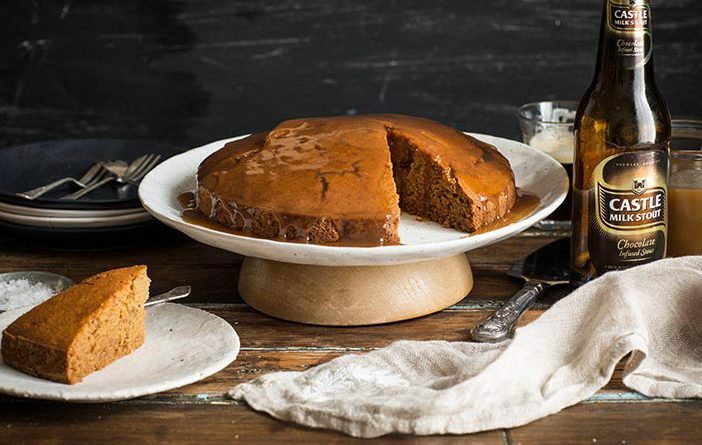 Made using three types of ginger, each of which add a different ‘gingery’ flavour dimension, and Castle Milk Stout, this cake isn’t overly sweet and the stout brings just a dash of much-needed bitterness to the festive cake. 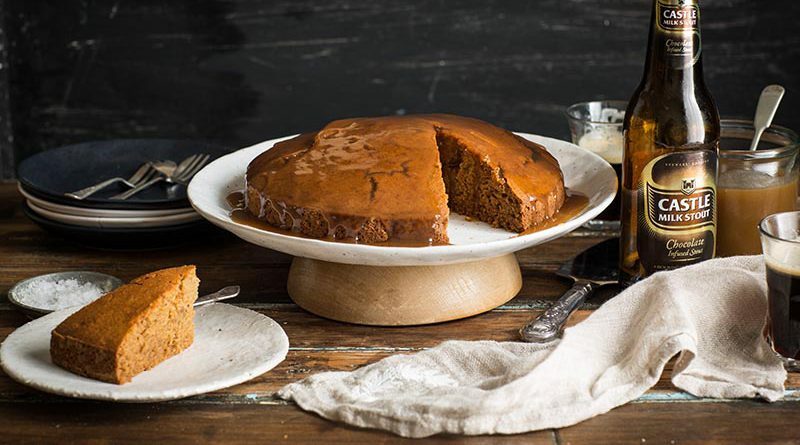 Finished off with a rich amber caramel sauce, made with the remainder of the beer, this is one cake that is sure to have guests asking for seconds at the Christmas table. To make the cake, place the stout and butter in a small pan and bring it to boiling point. Cook briefly and stir until the butter has dissolved. Remove it from the heat and allow it to cool a little. · Add the stout/ butter mix to a large bowl with the sugar and golden syrup and whisk until it’s well combined. Add the egg and whisk again. Add all the spices and whisk. Sift the flour and baking soda in by hand and whisk briefly until smooth (it will be fairly runny). While the cake is baking, make your butterscotch sauce. The quantities make a little more than you need for the cake but store the rest in a sterilized jar and use with other desserts. Bring the Castle Milk Stout Chocolate Infused and butter to the boil in a medium-sized pan and allow it to simmer for about 10 minutes until it has reduced by more than half. Add the sugar and continue to let this cook, stirring frequently until it reaches 110C / 225F on a sugar thermometer. This will take around 15 minutes. When it has reached temperature, add the cream while stirring constantly. Carry on cooking this until it thickens more. Once it has reached 105c on the thermometer it is ready. It will also thicken more as it cools. Let the cake cool to room temperature and then pour the warm sauce over to serve. Keep any extra on the side to serve. Preheat the oven to 180C and line a 20 – 22cm square or round cake tin with baking paper. If you are making this in advance, heat the sauce up a little before serving. While you’re in the kitchen, try this recipe for Cheats Crème Caramel. Recipe by Sam Linsell of Drizzle and Dip.